Generative writing [here realized in collaboration withCyrille Henry and Antoine Villere] French artist Miguel Chevalier and an attentive use of projection are the ingredients with which Miguel Chevalier literally immerse viewers into other worlds. 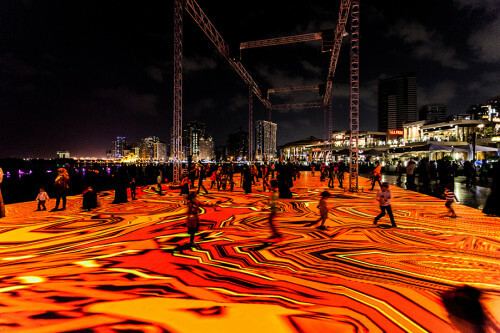 The Digital Arabesque 2014 installation was created specifically for the Islamic Festival and depicts a virtual reality that comes to life on the pavement of the Al Majaz Waterfront. Tradition and modernity coexist within the digital means they pass through. Dynamic multi-coloured graphic art evokes the techniques of mosaics, zelliges and the world of the Mashrabiya. All of this is generated by mathematical algorithms released into a virtual space where they come to life to generate a combinatorial infinity of shapes which evolve and are renewed. That’s not all. Viewers can interact and interfere with the work by bringing about changes and shifts in the trace of motion initially indicated by the software. In this way, space for causality is made. New and astonishing transformations are created, accompanied by the sensation of being immersed in a gigantic kaleidoscopic arabesque. 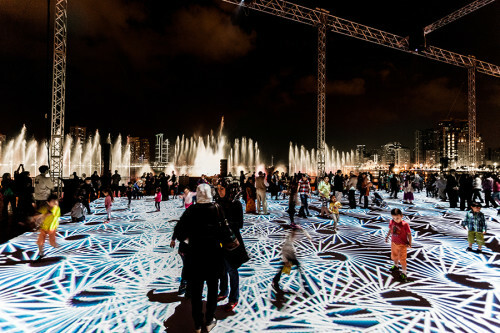 Nature, mathematics and machinery become part of a game of interference which translates into a vision that is dizzying, interactive and all-embracing. The idiom is inflected in its many facets, portrayed in its function at the service of Nature: in its manner of dictating the rules of creation and its evolution. In its function of writing the programming code controlling the machine (the computer) which catalogues functions and views; lastly. The idiom, lastly, is portrayed during the translating process (in this case, generated by the overlapping and intersection of this all and within the filter of the resolution of the installations) to offer the public an interactive and totally immersive version. 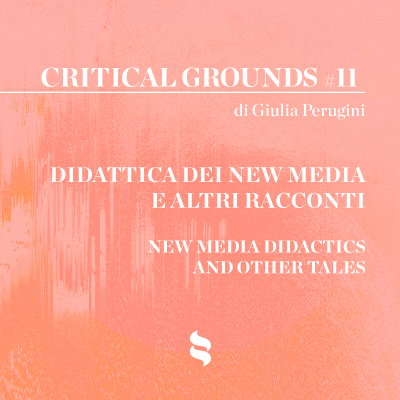 Therefore, Digital Arabesques 2014 is a hybrid work. From its creation in a studio through the writing of a programming code (in this case created by Cyrille Henry and Antoine Villeret), it opens onto the urban space to become the French artist’s very first public work. The study of an installation formula has indeed expanded towards a careful consideration that bears the urban space in mind. The result is an architectural solution which conceals the supporting frames of screening tools as much as possible. To the immersive view of the installation, the video produced by Claude Mossessian with a drone camera contrapposes another angle: the bird-eye gives us a viewpoint from above. 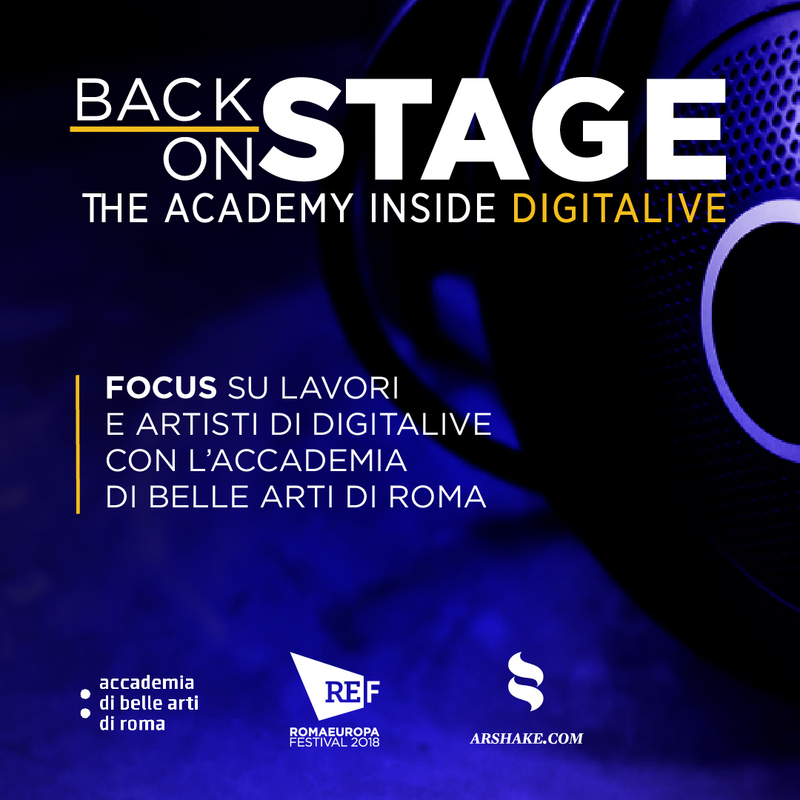 Once again analogical and digital are interwoven in a public work that – with the interaction with participants – is converted into a «zoom in» and «zoom out» analogical performance that brings to life changing and evolving compositions shaped by modernity and tradition.